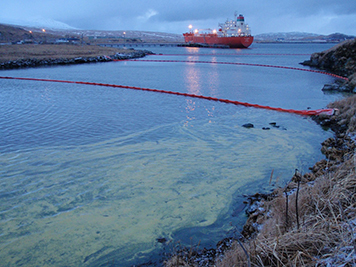 A boom containing oil after a 2010 spill near Adak, Alaska. The term Spill Tools™ originally referred to a set of three programs—the Mechanical Equipment Calculator, the In Situ Burn Calculator, and the Dispersant Mission Planner—designed to help oil spill planners and responders develop response plans that save time and money. The Response Options Calculator (ROC), which combines the new tools, and assesses how spilled oil will weather over time and the volume of oil that can be recovered, treated, or burned for the response systems selected. The EDSP Calculator developed by BSEE is Revision 1 of the Dispersant Mission Planner 2 (DMP2). The basic dispersant application algorithms remain the same as in DMP2; however, the programming environment used for the DMP2 is no longer supported. A document highlighting the major differences between the DMP2 and the EDSP Calculator can be found on the Genwest Systems, Inc. website. The above-listed planning tools are not intended to be used as models for calculating system performance during an actual oil spill, which is affected by many factors such as the distribution of oil on the water surface, oil weathering, and other ambient on-scene conditions that are not included in these calculators. NUCOS Unit Converter: This unit converter was designed especially for oil spill responders. SMART: Learn about Special Monitoring of Applied Response Technologies, or SMART, a cooperatively designed monitoring program for dispersants and in-situ burning. Dispersant Application Observer Job Aid: Use this field guide to help you identify dispersed and undispersed oil, describe oil characteristics, and report this information to decision-makers. Questions: Contact us with your questions or comments about these tools.